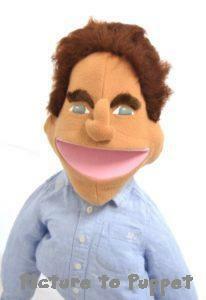 As part of our job making custom puppets to order, we quite often get asked to make celebrity puppets. We did these four caricature puppets recently based on four American political figures: a George Bush puppet, a Barack Obama puppet, an Arnold Schwarzenegger puppet and a Dr Phil Puppet. They’re all handmade talking puppets. 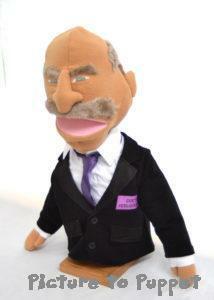 I really enjoy making caricature puppets, especially of figures that everyone recognises. It’s a challenge to work the puppetry mechanisms in whilst thinking about keeping the facial features recogniseable. 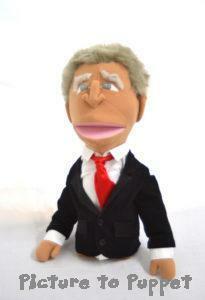 The George Bush Puppet boasts a tiny suit jack, bushy eyebrows and a very distinctive nose! A big chunk of my time as a puppet maker seems to be spent cutting out and shaping endless different noses, and no two are quite the same. People often imagine ordering a custom puppet is a build a bear style process of choosing lots of bits and having them put together. But in fact, every single component is made to order in the studio. For each one of my custom puppets, I make an entirely new foam head templete, a new nose, new eyes and new eyebrows, just by looking carefully at the picture and drawing them out freehand. Some of our custom puppets have simple round head structures, whereas others, such as this Arnold Schwarzenegger puppet, have a more complicated facial structure. In these cases I spend a long time sculpting blocks of foam and shaping the fabric around them. 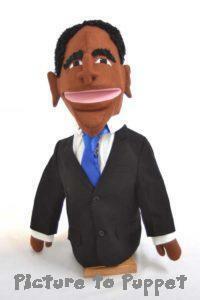 Possibly my favourite of my celebrity puppets so far, the Barack Obama puppet looks the most approachable! 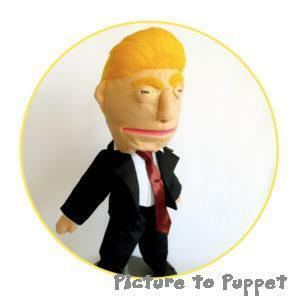 Our talking puppets are available as half body puppets (as in the first four examples) or full body puppets such as this Donald Trump Puppet. The half body puppets are slightly cheaper and are just missing the legs. Our full body talking puppets include real shoes. I spend ages looking around shops for the closest match to the picture you supply. Find out more about our service making custom puppets to order.